In mid-October 2012, Christopher Nolan sent Hans Zimmer a typewritten note that detailed the theme of his film and asked Zimmer to spend a day writing some musical ideas. When Zimmer received the note, he was attending a gathering of students at Loyola Marymount University's School of Film and Television. In one night, Zimmer wrote a four-minute piece with piano and organ. The composed piece as per Zimmer asserted feelings of "what it meant to be a father". Nolan heard the piece and superficially explained about the film. As the film also explores a father-daughter relationship, Nolan called that piece the "heart of the story". Nolan began writing with this piece of music sort of giving him company through the writing process, through the shoot. 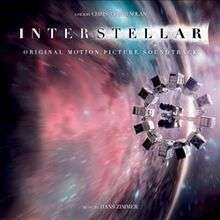 According to Zimmer, composers typically become involved toward the end of a film's creation, but for Interstellar, Zimmer began composing two years prior to its release. In an interview with The Hollywood Reporter, Zimmer stated that he could relate his relationship with his own son to the part mentioned in Nolan's first letter. Zimmer was quoted saying, "This story, this fable, these bits of dialogue he wrote for me were full of personal information that he has about myself and my children." According to Zimmer, Interstellar related to people in complete isolation. In summer of 2013, Zimmer isolated himself at his apartment in London for a month to live as a hermit. For Interstellar, Zimmer and Nolan both talked about Time Life books, the space, pictures by NASA available in books that kids read. It took two years for Zimmer to conceptualize and compose the score, in parallel with the scripting and shooting of the film. Usually, by the time Nolan was shooting a scene in the film, Zimmer was ready with the score for that particular scene. However, most of the actual recording was done in the late spring of 2014. Zimmer played every note of the score himself, making extensive use of his computers and synthesizers, and explained that it gave the music a singular quality. Later, however, he needed musicians to perform the complex instrumental score. 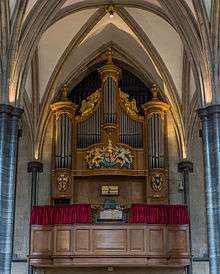 Zimmer and Nolan visited London's Temple Church to record the 1926 four-manual Harrison & Harrison organ played by the church's music director Roger Sayer. Further, for the overall score, Zimmer added an ensemble of 34 strings, 24 woodwinds and four pianos and recorded it at AIR's Lyndhurst Hall studios. Zimmer himself played the solo piano for the scenes in the film near Saturn. He also added a 60-voice mixed choir. As per Zimmer, the concept of air and breath resonates throughout the score, as the film revolves much with astronauts in spacesuits. Richard Harvey with Gavin Greenaway conducted the score. Zimmer told them to assemble a group of top woodwind players, then asked the musicians to play strange and unusual sounds with their instruments. The choral elements were experimental. Zimmer used the choir in traditionally unusual ways, for example, "to hear the exhalation of 60 people as if the wind flows through the dunes in the Sahara." He made the choir face away from the microphones, using them as reverb for the pianos. Zimmer explained, "The further we get away from Earth in the movie, the more the sound is generated by humans—but an alienation of human sounds. Like the video messages in the movie, they're a little more corroded, a little more abstract." The score received critical acclaim. Reviewing for BBC News, Nicholas Barber felt, "Hans Zimmer’s music makes the film seem even more colossal than it would otherwise: Zimmer invokes the original meaning of ‘pulls out all the stops’, rattling our teeth with reverberating pipe-organ chords." Scott Foundas, a chief film critic at Variety, stated, "Hans Zimmer contributes one of his most richly imagined and inventive scores, which ranges from a gentle electronic keyboard melody to brassy, Strauss-ian crescendos. Many critics have noted distinct similarities between the score and the work of Philip Glass, especially Koyaanisqatsi (1982). However, despite Interstellar's near-identical central melody and instrumentation, few have criticized Zimmer when drawing the comparison. Time Out London's Dave Calhoun exclaimed, "Listen to unnerving silence as well as Hans Zimmer’s organ-heavy score!" Tim Robey of The Telegraph felt "With the vast sounds of a composer set loose on his grandest ever assignment. But it relies less on Straussian majesty à la 2001 than something rather more pointed: the hypnotic, metronomically surging, and oddly sacred homage Zimmer gives us to Koyaanisqatsi, by Philip Glass." Todd McCarthy, reviewing for The Hollywood Reporter, praised it as, "soaring, sometimes domineering and unconventionally orchestrated wall-of-sound score" Richard Corliss of Time called it "pounding organ score". Jeremy Aspinall of Radio Times called the score subtle but evocative. Critic Jeffrey M. Anderson for The San Francisco Examiner writes, "rumbling and thundering sound effects and music". At The Irish Times, Donald Clarke wrote that "Hans Zimmer slumps on the biggest pipe organ in town". For NPR, Chris Klimek stated that Zimmer's gives a church-organ score. Joe Morgenstern for Wall Street Journal felt that "At one point the orchestral churnings of Hans Zimmer's score suggest something epic under way". American film critic Peter Travers at Rolling Stone noted, "thrilling images oomphed by Hans Zimmer's score, and you'll get the meaning of "‘rock the house.‘" For The Globe and Mail, Liam Lacey stated, "Throughout, Hans Zimmer’s music throbs obtrusively, occasionally fighting with the dialogue for our attention." "As usual, Nolan's frequent collaborator Hans Zimmer has come up with a score that fits the impossible dimensions of the film, and the music adds tremendously to the excitement," said critic Rene Rodriguez, writing for The Miami Herald. Ann Hornaday for The Washington Post commented, "Hans Zimmer's basso profundo organ-music score and pummeling sound effects." Steven Biscotti of Soundtrack.net too praised the soundtrack stating, "Hans Zimmer has created a close to perfect musical canvas for those extremely dedicated to the audio experience. The compositional technique on the album may turn off a few, as it is different than Zimmer's recent offerings. However, for those that stick with the album, they will see it 'not go gentle into that good night.' Zimmer's Interstellar rages!" and awarded a perfect five out of five stars. The soundtrack releases in three forms: "Star Wheel Constellation Chart Digipak" (16 tracks), "Digital Deluxe Album" (24 tracks) and "The Illuminated Star Projection Edition" in special illuminated star projection packaging consisting 2 CDs (29 tracks). All music composed by Hans Zimmer; "Do Not Go Gentle Into That Good Night", written by Dylan Thomas. In the run-up to Awards Season, Paramount Pictures uploaded the complete score for free, streaming it online. There are 33 tracks in total. ↑ Tapley, Kristopher (October 8, 2014). "Guardians of the Galaxy, Gone Girl, Interstellar scores get a jump on awards season". HitFix. Retrieved October 9, 2014. ↑ Jensen, Jeff (October 16, 2014). "Inside 'Interstellar,' Christopher Nolan's emotional space odyssey". Entertainment Weekly. Retrieved November 7, 2014. 1 2 3 4 5 6 7 8 Appelo, Tim (November 3, 2014). "Composer Hans Zimmer Talks 'Interstellar' Origin, Punk Influence on 'Dark Knight'". The Hollywood Reporter. Retrieved November 7, 2014. 1 2 3 4 5 6 7 Burlingame, John (November 6, 2014). "Hans Zimmer's Interstellar Adventure". The Film Music Society. Retrieved November 7, 2014. 1 2 Broxton, Jonathan (22 November 2014). "INTERSTELLAR - Hans Zimmer". Movie Music UK. Retrieved 13 December 2014. ↑ Southall, James (30 November 2014). "Interstellar soundtrack review". Movie Wave. Retrieved 13 December 2014. ↑ Geriak, Christopher (2 December 2014). "Interstellar(Hans Zimmer)-sputnikmusic". sputnikmusic.com. Retrieved 25 December 2014. ↑ Tillnes, Jørn (18 November 2014). "Soundtrack Review: Interstellar". Soundtrackgeek.com. Retrieved 2 January 2015. 1 2 Biscotti, Steven (18 November 2014). "Interstellar Soundtrack Review". Soundtrack.net. Retrieved 2 January 2015. ↑ Hurst, Steve (25 November 2014). "Interstellar Soundtrack Review". Filmwerk.com. Retrieved 3 January 2015. ↑ Barber, Nicholas (7 November 2014). "Film review: Does Interstellar reach the stars?". BBC. Retrieved 7 November 2014. ↑ Corliss, Richard (October 29, 2014). "Review: Interstellar Shows the Wonder of Worlds Beyond". Time Magazine. Retrieved October 29, 2014. ↑ Aspinall, Jeremy. "Interstellar". Radio Times. Retrieved 7 November 2014. ↑ Anderson, Jeffrey. "'Interstellar' traverses universe for little payoff". The Examiner. The Examiner. Retrieved 7 November 2014. ↑ "Interstellar review: a little bit lost in space". Irish Times. 7 November 2014. Retrieved 7 November 2014. ↑ "'Interstellar': Stunning And Bold, With Lots Of Corn". National Public Radio. November 6, 2014. Retrieved November 7, 2014. ↑ "Interstellar' Review: Too Many Faults in Its Stars". WSJ. November 6, 2014. Retrieved November 7, 2014. ↑ "Interstellar". Rolling Stone. 5 November 2014. Retrieved 7 November 2014. ↑ Lacey, Liam (4 November 2014). "Interstellar: Awesome to awful at warp speed". The Globe and Mail. Retrieved 7 November 2014. ↑ "'Interstellar' (PG-13)". Miami Herald. 5 November 2014. Retrieved 7 November 2014. ↑ "'Interstellar' movie review: There's a lot, but does it add up to anything?". The Washington Post. Retrieved 7 November 2014. ↑ "Christopher Nolan Breaks Silence on 'Interstellar' Sound (Exclusive)". The Hollywood Reporter. Retrieved 23 November 2014. ↑ "Awards 2014: For Your Consideration". ↑ "Interstellar soundtrack information". Soundtrack.net. Retrieved 7 November 2014. ↑ "Interstellar Soundtrack 'Interstellar Soundtrack - Illuminated Star Projection Edition' @ Interstellar Soundtrack Store US". MyPlay Direct. Retrieved 9 January 2015. ↑ "Interstellar - MovieTickets.com". MovieTickets.com. Retrieved 8 November 2014. ↑ "One Direction Four Is ARIA No 1 Album". Noise11. Australia. Retrieved November 23, 2014. ↑ "Ultratop.be – Soundtrack / Hans Zimmer – Interstellar" (in Dutch). Hung Medien. Retrieved January 22, 2015. ↑ "Ultratop.be – Soundtrack / Hans Zimmer – Interstellar" (in French). Hung Medien. Retrieved January 22, 2015. ↑ "Dutchcharts.nl – Soundtrack / Hans Zimmer – Interstellar" (in Dutch). Hung Medien. Retrieved January 22, 2015. ↑ "Lescharts.com – Soundtrack / Hans Zimmer – Interstellar". Hung Medien. Retrieved January 22, 2015. ↑ "Officialcharts.de – Soundtrack / Hans Zimmer – Interstellar". GfK Entertainment Charts. Retrieved January 22, 2015. ↑ "South Korea Gaon Album Chart". On the page, select "2014.11.16~2014.11.22" to obtain the corresponding chart. Gaon Chart Retrieved January 22, 2015. ↑ "Spanishcharts.com – Soundtrack / Hans Zimmer – Interstellar". Hung Medien. Retrieved January 22, 2015. ↑ "[Warner&cat=a Swisscharts.com – Soundtrack / Hans Zimmer – Interstellar [Warner]"]. Hung Medien. Retrieved January 22, 2015.